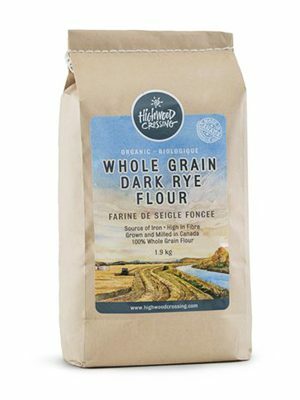 Highwood Crossing Whole Wheat Pastry Flour is ground from soft white wheat, making it lower in protein and gluten strength than our All-Purpose or Whole Wheat Flours. 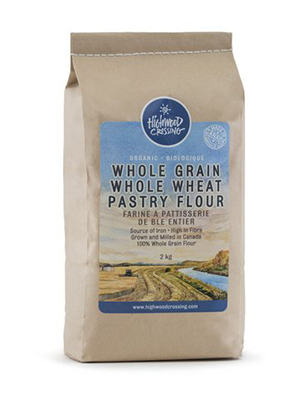 Our Organic Whole Wheat Pastry Flour is certified organic and non-GMO, is a high source of fibre and a source of iron. Milled in a nut and peanut free environment. 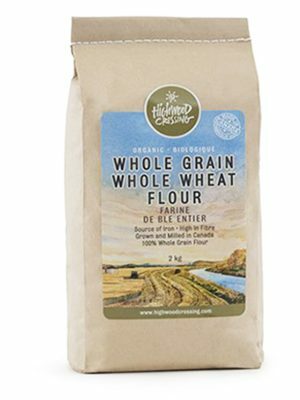 Our Organic Whole Wheat Pastry Flour has more fibre and is therefore more beneficial and nutritionally complete than All-Purpose Flour because the bran and germ of the wheat berry are not removed during milling. 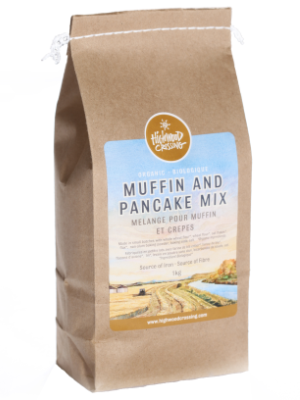 It is excellent for use when baking cookies, muffins or loaves. However, because it has less gluten, it is not recommended for use in breads. While Whole Wheat Pastry Flour isn’t as “light” as traditional pastry flour, it is close in texture and taste, making it appropriate for baking all but the most delicate pastries and cakes. A healthy treat to have in the afternoon – just like the coffee shops…only better! Mix dry ingredients in bowl. Mix milk, egg and oil together in another bowl and add to dry ingredients until moistened. Turn mixture out onto a counter and use your hands to form dough into a mound. Press dough into a large flat circle and use the edge of a glass or a biscuit cutter to cut out rounds of dough. Place scones on a lightly greased baking sheet. Bake in preheated 375° F oven for 15-20 minutes until golden in color. Let cool 10 minutes. Drizzle icing (1 Tablespoon lemon juice mixed with 1/4 cup icing sugar) over each scone and enjoy! Makes about 10 scones. Freeze to have on hand and microwave to reheat.